I remember this song from my childhood...there was a time in my life when I was MORE than 500 miles from home, actually it was more like a thousand miles from my parents, sister, grandparents as a newly wed! Now it's more like a 500 mile round trip - much easier to make as I'm no longer that young woman raising two young'uns with my hubby in Tennessee... those were the days! Ah, but that's not what I want to reminisce about today...today I'm thankful for the closer distance to my roots....deep family roots that have shaped me to who I am today (at least the good parts, can't blame my family for my mistakes, I've made those all by myself ). 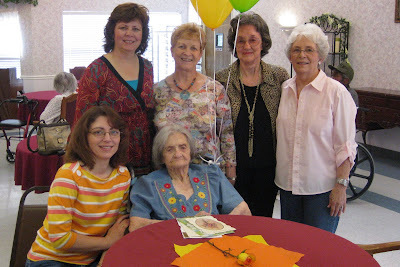 In the photo above is my grandmother, we celebrated her 97th birthday this week. My younger sister is seated next to her, behind her is myself, next to me is my aunt who is married to my mother's brother, the next lady is also married into the family to one of my mother's cousins, and my mom is the cute one in pink. I have to admit as wonderful as the day was it was also very difficult emotionally for me. A strong reminder that time does march on. I'm not the little girl baking cookies at my grandmother's house any more. Many, many pillars of my life are now among those faithful cloud of witnesses, gone on before to their heavenly reward. The empty place settings, how be it only in my mind, were a harsh reality as I fought to maintain my composure several times. Our "party" was scheduled at 2:30 as one of the "activities" for the residents. At 3 PM a big burly of a fellow came in with a guitar...he had the sweetest voice as he sang many of the old time hymns. From what I learned he is an ER nurse and comes regularly to sing with the residents, yes, many many were joining him in song. He was such a testimony for Jesus. Again, difficult to maintain my composure as I joined in several songs that hold a special memory from my past. I am counting my blessings that I was raised in a Christian home, from a long line of faithful believers in Jesus Christ, the Son of God. Faithful family that shared the love of God through their love for one another that overflowed to others. Giving, compassionate, steadfast. Strong. Can't put into words what that one simple word means to me. Many gone, many still here, many more to join us in the future. Boggles my mind.